We have been offering the best Spy Gear products for over 15 years now, and we want to ensure everyone has a way of keeping themselves and their families safe from predators, and businesses safe from theft and vandalism. All of the products we sell come with 1, 2 or LIFETIME Warranties and FREE Tech Support. You won't get either of those if you purchase from Amazon or E-Bay. EXCLUSIVELY ONLY FROM GLC ENTERPRISES! Live Encrypted 1080P High Definition Video is Transmitted to Your Wireless Router Enabling Live Streaming on Demand from Any Authorized PC, IPhone, IPad or Android Device. Automatic Connection to Your Wireless Router is Simple and Quick, NO PC Expert is Required, Just Set It & Forget It! Video is Recorded on a Hidden SD Card Contained Within the Hidden Camera that is Concealed By a Secret Trap Door For Complete Covert Surveillance. Our Live-View Cameras shown above are the MOST Advanced Hidden Cameras on the Market Today. Our SecureShot HD-Live View's are Self-Contained Record & Remote View Cameras that have 24 Major Features that Other Companies Simply Can't Match. 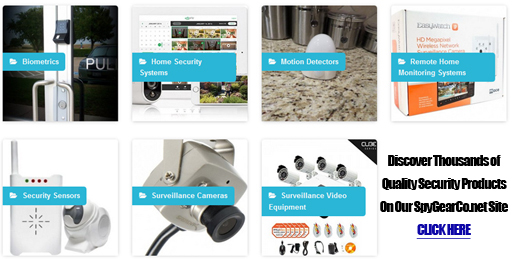 These Hidden Cameras are the #1 Choice for Home and Professional Surveillance. Click Here to See All the Features. Introducing Custom Made 4K Hidden Cameras with EXTREME Clarity. 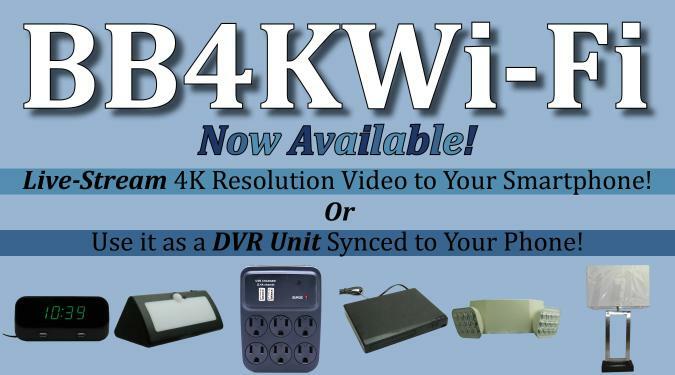 Streams 4K Video to Your Smart Phone or Any Device Capable of Displaying 4K Resolution. Our 4K Cameras are Built on Our STATE-OF-THE-ART 3-D Printers. Not Junk from Other Countries, That's Why They Come with a Lifetime Warranty & FREE Tech Support. Mini Alarm Clock: NO Visible Camera Hole! Introducing the Latest in Security Technology!!! INCLUDES FREE 32GB Micro SD card, FREE Tech Support & 1 Year Warranty! This is a "Next Generation" covert security camera. 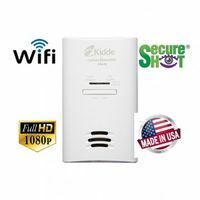 Introducing the SecureShot HD-Live View self contained, high definition, self recording system with Wi-Fi so you can watch what is happening in your home or business. 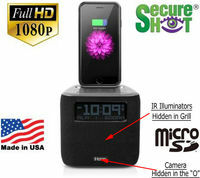 Our SecureShot HD Live View Ihome Cube Clock Radio Spy Camera/DVR includes a 1 year warranty and FREE tech support. CLICK HERE for details & Demo Video. Totally Covert Ipod Dock Clock Radio. No Pinhole Camera. This high quality dual alarm clock radio will charge your Iphone or Android device via USB port (with your own cable). Bluetooth feature allow for wireless playback of your music library from your phone. Bluetooth Stereo Dual Alarm FM Clock Radio with USB Charging and Speakerphone The iBT38 is a fully featured bedside alarm clock with twin speakers for room-filling sound Control your music or take calls with wireless speakerphone over Bluetooth, or listen to FM radio or aux-in audio. 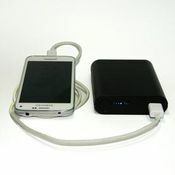 A 1 Amp USB port keeps mobile devices charged and ready to go. 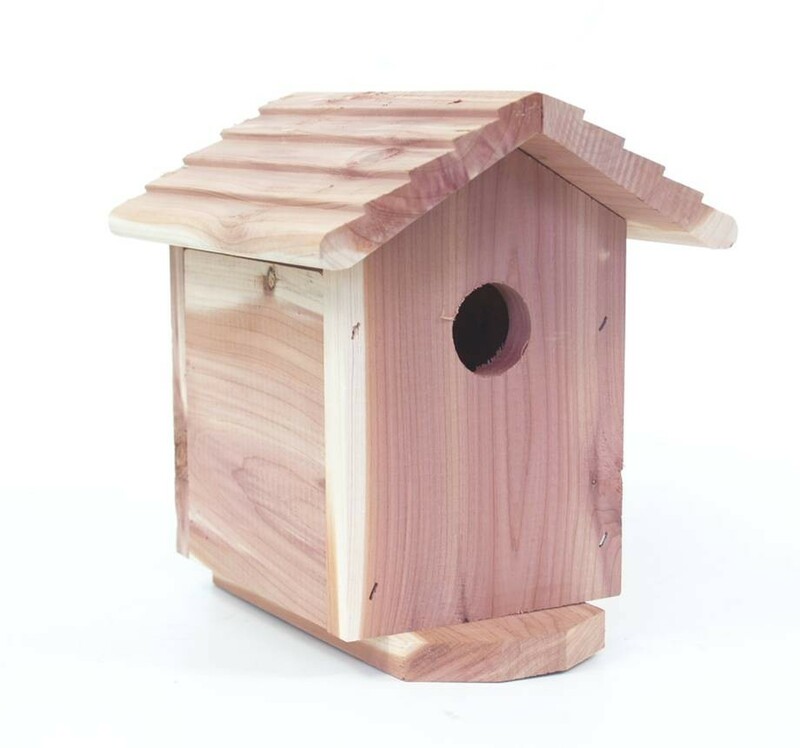 This product is also equipped with the worlds most powerful next generation of covert security cameras has arrived. Introducing the SecureShot HD-Live View self contained,1080P Full high definition, self recording system with Wi-Fi. Our Samsung 3D Blu Ray Player is the latest in covert surveillance technology. No Other Company in the World Can Figure Out How to Put this Much HI-REF Remote Technology Into This Small Space But GLC Enterprises! Absolutely AMAZING Live Encrypted 720P High Definition Video Quality. Watch your kids, business or your cheating spouse from your Smart Phone while being recorded on a SD card that is hidden by a secret trap door. No computer needed to record. Very Easy Setup. HOT SELLER With 1080p Hi-Def! 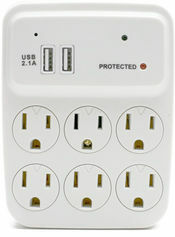 Night Vision Electrical Box Hidden Camera/DVR with 1 Year Standby & Records 12 Hours on a Single Charge! 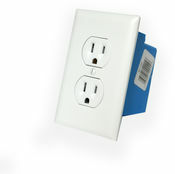 The Night Vision Electrical Box Hidden Camera/DVR is perfect for any outdoor location. 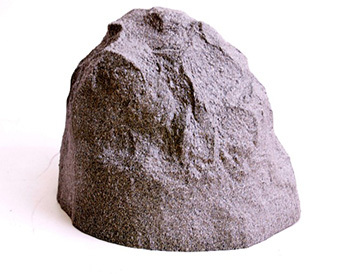 Pools, Carports, Garages, Gardens, Car Lots, Entrance Ways at Fences, Driveways, Construction Sites (most common), Vacation Homes, and many other locations. PIR (body heat) motion activation virtually eliminates false triggers. Only 7 1/2 x 5 x 2 1/4 inches in size! View Live on Your Smartphone & Record to a Micro DS Card or to Your Phone or Tablet. No you can follow anyone you want up to 90 degrees using a VERY covert mini cam. With this hidden camera, you can keep track of your kids, a nanny, or your home from a distance on your smart phone. The device can be set up to stream live videos which you can view on your smart phone, tablet or PC. Are you looking for a Covert Clock at an affordable cost? This is it! This small compact desk clock is perfect for any office or home and allows you Livestream video from anywhere at any time. See and hear your cheating spouse or office worker doing bad things. 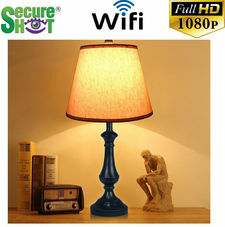 Our Secure Shot HD Live View Antique Lamp Spy Camera/DVR is almost impossible to discover as this product blends into almost any room without looking out of place. Like all WIFI Spy Camera products, it is easily operated by a Smartphone App. With the easy set-up you can be on your way to streaming live video within minutes! 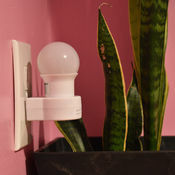 No need to worry about a battery charge as this Lamp and Camera is powered by its own AC power. Fully Functional - No need to worry about a lamp you wont be able to to fully use. This lamp is a fully functional lamp. 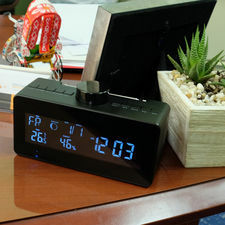 WiFi FM Radio/Weather Station Clock Radio is a Very Covert Camera/DVR System with Rotatable Lens. Looking for a covert camera that you can put anywhere? Our WiFi Clock Weather Station Spy Camera/DVR w/Rotatable Lens, offers WIFI capabilities, FM Radio, Clock, and weather station. With its full HD resolution and rotatable lens you wont miss anything that is needing to be captured! WiFi Capability - Download its free app to stream live from your smart phone, set to motion detection, set up email or app alerts, or rotate the camera lens! FM Radio / Weather Station - This device functions as a FM clock radio and weather station, ensuring that it looks nothing out of the ordinary! Rotatable Lens - This lens can easily be moved 330 degrees through the phone's application with just the swipe of your finger! Don't miss out on any evidence! HD Resolution - This device streams in full 1080P HD resolution. External Memory - This device can take up to a 128GB MicroSD card, so you never have to worry about storage! This Totally Portable SecureShot "Smoke Detector" Camera Can Quickly be Placed in Any Location Without the Hassle of AC Outlets or Extension Cords Using a Magnetic Mount! Ultra Life 1080P High Definition Smoke Detector w/1 Year Standby Battery, 128GB Card Support and Nightvision. 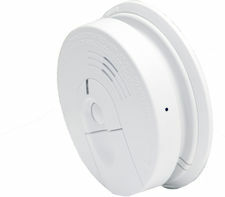 SecureShot motion activated, battery powered imitation smoke detector. Featuring 1 months standby power and over 20 hours of recording per charge Available in "down view" or "side view" with night vision invisible IR illuminators. 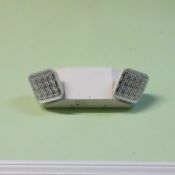 Great for mounting on wall or ceiling. 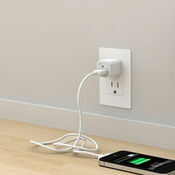 Removable Li-ion battery for easy charging or swapping. Being able to see and hear what's going on in your home or business is the basic cornerstone of our business philosophy. With events like 9/11 and the London bombings fueling terrorism fears nationwide, we're seeing an massive increase in security and surveillance products. Video surveillance cameras are a huge part of that trend. According to a new report from market research firm IMS Research, the Global Video Surveillance market was valued at USD 36.89 Billion in 2018 and is expected to reach USD 68.34 Billion by 2023. That's a more than 80 percent increase in the next five years - and a sure sign of even more growth to come. The reason for this is rapidly rising crime that is spreading Worldwide, including random mass shootings in schools, places of work and recreation areas. Trusting employees, your nanny, your spouse or your children is becoming a thing of the past but in some cases you get lucky and find people you can trust. With Rising Thefts, Global Terrorism, Random Mass Killings, Child Abuse... Due To Ongoing Economic Pressures, Keeping an Eye on Your Home or Business in Today's Economy Has Become the "NORM"! Whatever your reason for wanting the ability to keep an eye on your home or business, our equipment is simple to use and install. If you should have any trouble, we will walk you through the process over the phone. You and you alone are responsible for protecting yourself, so make sure you're prepared. Our hidden cameras, nanny cams, spy and surveillance equipment are the most advanced "State-of-the-Art" products on the market today. Let us know if you have any questions. Our cameras and full systems are the most sought after Spy and Surveillance products on the market today. We leave our competition in the dust because MANY of our hidden cameras are manufactured in our warehouse.